Thermophilic Archaea and Bacteria occupy heated environments. Advancement of next-generation sequencing (NGS), single-cell analyses, and combinations of –omics and microscopic technologies have resulted in the discovery of new thermophiles. This e-book consists of a review, and 10 original articles authored by 94 authors. The main aim of this Research Topic of Frontiers in Microbiology was to provide a platform for researchers to describe recent findings on the ecology of thermophiles using NGS, functional genomics, comparative genomics, gene evolution, and extremozyme discovery. Copyright © 2017 Goh, Chan, Sani, Donati and Reysenbach. This is an openaccess article distributed under the terms of the Creative Commons Attribution License (CC BY). The use, distribution or reproduction in other forums is permitted, provided the original author(s) or licensor are credited and that the original publication in this journal is cited, in accordance with accepted academic practice. No use, distribution or reproduction is permitted which does not comply with these terms. Goh, K. M., Chan, K. G., Sani, R. K., Donati, E. R., & Reysenbach, A. L. (2017). 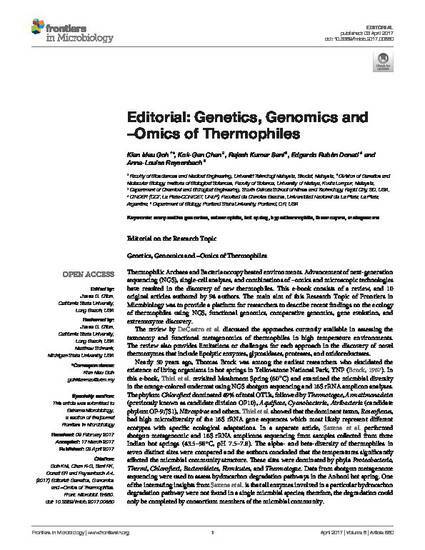 Genetics, Genomics and–Omics of Thermophiles. Frontiers in Microbiology, 8.